The first F-4 model to enter German service was the RF-4E. The Luftwaffe signed a contract with McDonnell Douglas for 88 RF-4Es in 1968; at the time the biggest order outside the USAF. 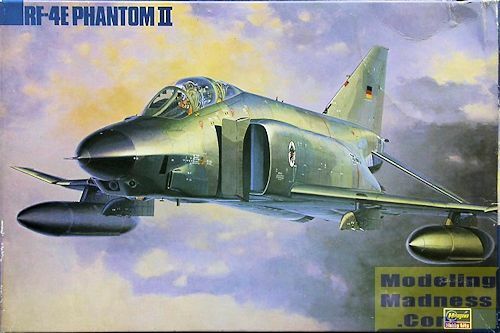 The contract included industrial offsets for German industry, particularly production work for Messerschmitt-Bölkow-Blohm who manufactured and supplied F-4 components to McDonnell Douglas' Phantom production facility in St. Louis. On 16 January 1971 the first RF-4E, dubbed the "Spirit of St. Louis", flew from the U.S. to Spain and finally onto Germany. The next day, at Bremgarten, the aircraft was accepted by the Inspekteur der Luftwaffe ("Inspector of the Luftwaffe", Gunther Rall. In 1972, with eight Phantoms per month being delivered, Aufklärungsgeschwader 51 "Immelmann" equipped with the RF-4, followed by AG 52, based at Leck. The German RF-4E was equipped similarly to the USAF RF-4Cs, using the latest F-4E airframe and more-powerful engines. The RF-4Es were employed as day/night reconnaissance aircraft, equipped with four cameras covering 180 degrees. There were special flares for night use and two night/all-weather reconnaissance systems. One was the IRRS (Infrared Recognition System) and the other was the SLAR (Side-Looking Airborne Radar), mounted in the side of the fuselage. The aircraft had the capability to develop photos in flight and then drop them using special cartridges. Missions were generally flown at low level and high speed, using the installed APQ-99 radar for navigation. Deliveries were completed in May 1972 and the previously employed RF-104Gs were modified to serve in strike or fighter units. Another user of new RF-4Es was Japan. Fourteen RF-4Es were delivered between November 1974 and June 1975. These were similar to the RF-4C, but, as for the F-EJs, Japanese-built radar warning receivers and other equipment were substituted to replace equipment which was not released for export to Japan. These aircraft were replaced by pod-carrying F-4EJkai aircraft when the RF-4Es were taken out of service. Back in the late 1980s and early 1990s, Hasegawa embarked on a program of F-4 Phantom II kits. This would be the third time they did new molds of this aircraft, their initial kit being a very crude F-4J that could also be done as an initial production F-4D and only came with generic markings and is best left to collectors. Their second offering was pretty much a gun Phantom that was done in several boxings including an F-4E, F-4F and F-4EJ. This one wasn't all that bad and though not at all up to modern standards, does build into a fairly nice model. I have built several, the last one being a stand model. Since this is a modern modular kit, there are a lot of pieces. Some of these you will not need. The cockpit is pretty basic, but is typical of what Hasegawa produces, even today. 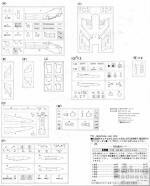 Instruments and consoles are provided as decals, there are two properly shaped Martin Baker ejection seats that are devoid of harnesses. Front and rear control sticks are included. I'm not sure if the RF-4 actually had a back seat control as the GIB was pretty much the camera/radar systems operator. Typical of many kits, the nose is separate and includes two camera shapes and the proper windows. The USN refueling gear panels will need filled. There are two different camera window options for the underside. One is the older, more angular window and the other is the more streamlined version that was retrofit to many USAF and Japanese RF-4s. The aft fuselage is separate and the join area is right behind the intakes. Intakes are several pieces and I've always had to fill the rear join area. There are inlet sensors provided as well. To the bottom of this is fit the five piece wing. There is a single lower section that goes out as far as the wing fold and atop this are the two upper wing sections. These have the bulges on them for the larger wheels. Outer wing sections are separate. 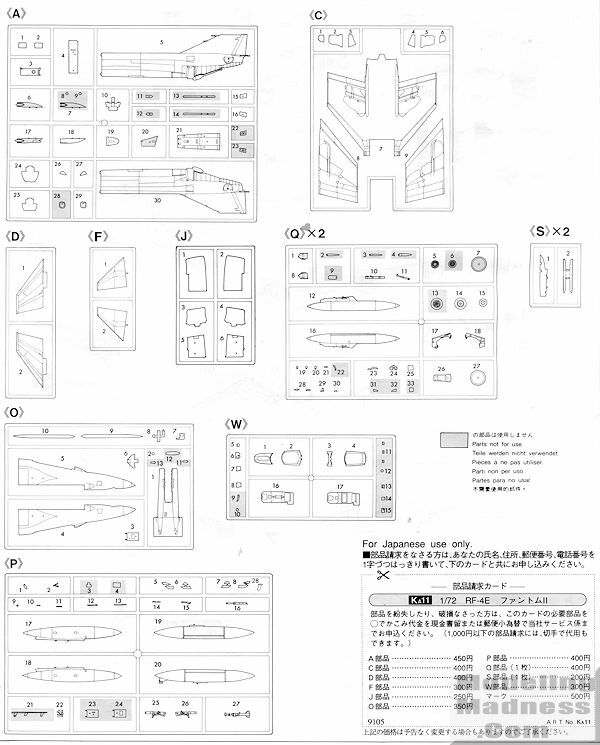 You cannot model the kit as it comes in the box with the wings folded. Stabs are the non slotted versions as RF-4s value speed over a lower landing speed. There are several fit tips provided, including the one appropriate for the RF-4E. There are two sets of burner cans and you want the longer ones for the E version. The cockpit clear bits are in four pieces. This is to allow the front and rear canopy to be displayed up and there are retraction struts provided for this option. Landing gear is nicely done and you have the proper wheel inserts for this variant along with others you do not use. For things under wings you have three fuel tanks, including the newer F-15 style for the centerline if you wish to use it. A pair of USAF wing pylons are included and while they show Sidewinder rails being attached, I do not think Japanese or German RF-4Es were ever so equipped. Those would usually have either travel pods or jamming pods attached. Neither of those items are included in the kit. The pylons would have the dispensers on them later in life. Instructions show four different markings options, but really, there are more. There are two German planes in the wraparound lizard scheme. These planes differ by serial number and unit badge as you are provided badges for both AKG 51 and AKG 52. If you wish to do the earlier splinter scheme, there are aftermarket decals that have those. The other two options are Japanese and with markings for the only unit to use it, 501 Squadron. The first option uses the camouflage scheme that I used on this 1/48 build. Serial numbers for all 14 aircraft are provided. The other is for the initial delivery batch in light gull grey over white with the large fin markings and only one serial option. You also get a ton of stencils, but fortunately, Hasegawa has done these in such a way that many in the same area are on the same carrier. These are 'old school' Hasegawa decals where they are a bit thick, will require very hot water to work properly, and have white bits that are actually off-white. So there it is, another fine addition to the Hasegawa Phantom family. 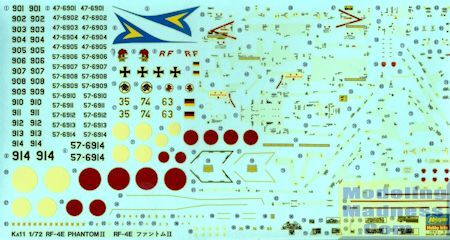 From the look of the sprues, you could do a USAF RF-4C using this particular kit. I only mention this as the Hasegawa RF-4C kit is not all that easy to find and the RF-4E kit is not considered as desirable. This means that if you have aftermarket RF-4C markings you want to use and can only find the RF-4E kit, you are probably going to be in luck. Thanks to your editor for the preview kit.